A Brain Bank is a specialised “bank” or collection of human brain and other tissues of the central nervous system obtained from deceased donors. The primary objective of the MS Research Australia Brain Bank is to coordinate the collection, storage and use of human post-mortem tissue from people with multiple sclerosis (MS) for use in research. MS can be a devastating disease and a common cause of neurological disability in young adults. It has a huge economic impact on people with MS, their carers and the community. Modern immunotherapy makes a difference, but there is no proven cure. We also have no useful treatment for people with progressive MS. This is why there is a need for continuing research into MS.
Why do we need an MS-specific Brain Bank? It is now possible to make a fruit fly with Parkinsons Disease and a mouse with the features of Alzheimers Disease. Unless you can relate what you find back to the human brain, you don’t really know if you’re on the right track. Since brain tissue is not generally available for research use during life, this means research must be done on post mortem tissue. People with MS in Australia can choose to donate their brain and other tissues of the nervous system for the purposes of MS research after their death. Consented tissue is retrieved and preserved as rapidly as possible (within 24 hours) after death and stored together with the donor’s medical history. 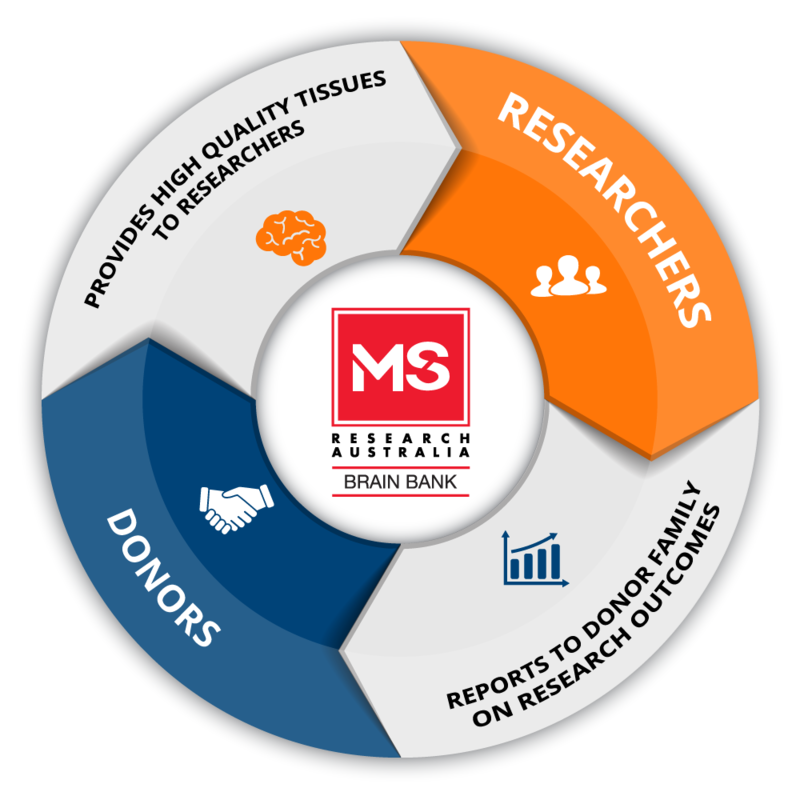 The MS Research Australia Brain Bank facilitates MS research by distributing high quality and well-characterised MS tissue to researchers for investigating the cause of and developing a cure for MS. Registered MS Brain Donors and their families are kept up to date on the latest progress in MS research. The MS Research Australia Brain Bank has a huge responsibility. People with MS, in bequeathing tissue for scientific research, are making a final gift to others with MS and their families. They hope that their gift will lead to better treatments, improved understanding and ultimately a cure for others. So we really see the MS Research Australia Brain Bank as owned by people with MS and their families. Our brief as custodians of the tissue for each donor and their family, is to make certain it will be of most use to scientists working on MS, so that the understanding of the disease increases. We also wish to thank the Trish MS Research Foundation, University of Sydney, Collier Charitable Fund, NSW Government’s Office for Science and Medical Research and MS Research Australia for their generous support that has made the MS Research Australia Brain Bank possible.